Question: Can I pay the application fee through demand draft? Question: I am appearing in 12th class examination in 2018, should I have to enter the 12th class roll number? Question: May name is different in Aadhaar Card and School Records. Which details should I fill in the application form. Question: I am belonging to Assam state and did not have Aadhaar Card. How can I apply for JEE Main 2018? Question: I have made mistakes in the JEE Main Application Form 2018. Can I correct the entries filled in the application? Question: I am NIOS student, can I apply for JEE Main entrance exam 2018? Question: I have forgotten to mention name and date in the photograph. Will my application be rejected? Question: Is there any need to upload the thumb impression in the JEE Main 2018 Application Form? JEE Main 2018 Application Form: How to apply? JEE Main 2018 Application has been started from 1st December. JEE Main is the popular engineering entrance exam in India. It is conducted by CBSE for admission to B.E./B.Tech & B.Arch courses. On the basis of JEE Main, candidates are admitted to NITs, CFTIs and other engineering institutions. JEE Main is also the eligibility test for JEE Advanced which offers admission to IITs & ISM. Students can get complete information about JEE Main 2018such as application form, eligibility, exam dates, exam pattern and syllabus. JEE Main 2018 Application form has been started now from 1st December 2017.Check here for application. Click here to read complete details. JEE Main 2018 Slot Booking facility will be offered to the candidates for online examination. Check here to know more. JEE Main 2018 Pen-paper based (offline) examination will be conducted on 08th April 2018. The computer based (online) examination will be conducted on 15th & 16th April 2018. Click here to view other dates. Applications have been started from 1st December 2017. Candidates opting e-challan are required to make the payment in Syndicate/ICICI/Canara Bank in cash. JEE Main Correction window will also open for correction in application form details like change in exam mode from PBT to CBT, city of examination, change in paper-2 to paper-1. Number of Questions: 30 questions will be asked from each subject with total of 90 questions comprising of 360 marks. Language: For all exam cities, the question paper medium choice will be English & Hindi(except exam centre cities in Gujarat, Daman & Diu and Dadra and Nagar Haveli where choices for question paper will be English, Hindi and Gujarati). The choice for question paper should be exercised while filling up the application form. Negative Marking: In case of wrong answer, one mark will be deducted. After submitting the application form, candidates start searching the admit card. JEE Main 2018 admit card will be issued in the second week of March 2018. The board will also provide the facility to book slot for the online mode examination. CBSE will publish the answer key & images of response sheets (OMR) of paper-1 and paper-2 during 24th – 27th April 2018. Candidates can cross check their answers with the official answer key to know the expected marks. Those who are not satisfied with the answers may challenge the answer key by paying Rs. 1000/- per question. Result of JEE Main (paper 1) will be declared on 30th April 2018 through online mode. JEE Main 2018 result indicates actual scores and rank secured in entrance examination. All India Rank (AIR) for paper 2 will be published on 31st May 2018. On the basis of JEE Main result, students will also get idea about whether they are eligible for appearing JEE Advanced or not. All India rank (AIR) will be considered for admission to IITs, NITs, IIITs, CFTIs, SFTIs and others. There are huge number of colleges in every state that also offer admission through JEE Main. To get admission in these colleges, students have to apply separately in state couselling. JEE Main 2018 Registration has been started from 1st December. Joint Entrance Exam (JEE) Main is a most important national level entrance test administrated by the CBSE Board. JEE Main exam is organized for admission in UG engineering (B.Tech) & architecture (B.Arch) courses offered by IITs, NITs, IIITs and other institutions. JEE Main score is considered all over the country for providing admission in B.Tech or B.Arch courses. In this article, candidates can get the core information about JEE Main 2018 application form including fee structure, eligibility criteria, application dates & FAQs and how to fill application procedure. JEE Main 2018 Application Form has been started from 1st December 2017. Click here to apply. The application form is released from 1st December 2017. Students should fill the application carefully as per the instructions are given in the information bulletin. The authority shall also provide the correction facility for the application form. Upload the scanned images of passport size photograph and signature of candidate & guardian. Images should be in JPG or JPEG format. Candidates have to mention the name and date of taking photograph in the image. Candidates also have to book exam slot while filling up the application form. After the fee payment confirmation, students should take the print copy of the confirmation page for further use. There is no need to send the printed confirmation page to the CBSE board. Qualifying Exam: Students should have passed the 12th or equivalent exam in 2016 and 2017 with five subjects from any recognized board. Appearing Candidates: Students appearing in the 12th examination in 2018 are also eligible. Subjects: Students must have the Physics & Mathematics as compulsory subjects along with one of the Chemistry/Biotechnology/Biology/ Technical Vocational subject. Age Limit: Students born on or after 1st October 1993 are eligible to apply (five-year relaxation is given for reserved categories. Percentage: There is no minimum marks are needed to appear in the JEE Main exam. For admission to IITs, NITs, CFTIs, students must have secured 75% marks (65% for SC/ST) or be in the top 20 percentile. Attempt: Students can appear only three times for JEE Main. Aadhaar Card: All India candidates must have Aadhaar Card to apply for JEE Main. Visit the official website of JEE Main 2018 (link will be provided above). Go through the link “Apply for JEE Main 2018”. Read the instructions carefully and click on the “Proceed to Apply Online”. Authentication form will appear on the screen, fill all the necessary details and submit it. Now, the JEE Main 2018 Application Form will appear on the screen. Fill the required details like personal, exam related, academic, address, guardians, etc. Review the application form and verify your details before submitting. Select the “Upload Scanned Images” option. Click on the “Browse” button to select the scanned images. Now click on “Final Upload” button to upload the scanned images of a photograph and signature of candidate & guardian. Go through the “Pay Examination Fee” option. Pay the application fee through online or offline mode as per your choice. After the fee payment confirmation, log in again with your Application Number and Password. Click on the link related to “Print Acknowledgment Page” and take the printout of it. Candidates are advised to preserve the application form for further use. Answer: No, payment through DD will not be accepted. Answer: 12th class roll number option is not mandatory, if it is allotted you may fill it or otherwise leave it empty. Answer: You should submit a correction request at Aadhaar Card Centre and fill the application by entering 14 digits Aadhaar Enrollment ID/UR Number. Answer: You can apply through passport number, ration card number, bank account number or any other valid Govt. identity number. Answer: Yes, the authority shall also provide the correction facility in application form. Answer: Yes, NIOS students can also apply. Answer: No, the application will not be rejected in this case. Answer: There is no need to upload the thumb impression. If you have any other queries about JEE Main 2018 Registration, you can leave your queries below. JEE Main 2018 registrations have commenced on the official website of the exam. Apply now! The Central Board of Secondary Education(CBSE) announced JEE Main 2018 online exam dates. According to the offical website, JEE Main 2018 online exam will be held on April 15 and 16. Along with this, the board has also released the JEE Main 2018 information brochure with further details like JEE Main 2018 important dates, JEE Main 2018 eligiblity criteria, JEE Main 2018 test centres, JEE Main 2018 syllabus, JEE Main 2018 examination fee etc. The last date to fill JEE Main 2018 application forms is January 1, 2018. However, the fee can be paid till January 2. The release stated, “The states of Madhya Pradesh, Haryana, Uttarakhand, Nagaland & Odisha have joined JEE(Main) system. Therefore, candidates seeking admission to the institutions in these stsates, which were earlier admitting based on their State level examination, are also advised to fill in JEE(Main) -2018 application form online”. JEE Main 2018 offline exam date was declared by CBSE (Central Board of Secondary Education) recently. The offline (pen-paper) mode of JEE Main 2018 exam will be held on April 8. JEE Main 2018 exam will be conducted in online as well as offline mode. 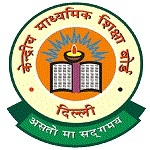 JEE Main is typically is held in the month of April every year. Check JEE Main 2018 important dates here. How to apply for JEE Main 2018? To begin with, aspirants need to register for JEE Main 2018 on the official website. For the same, aspirants need to click on the “Apply for JEE Main – 2018” under “New Candidate Registration. Eligible candidates will be able to register for JEE Main 2018 only if they have they have Aadhaar Cards. This requirement, however, is not necessary for aspirants hailing from Assam, Jammu & Kashmir and Meghalaya. At this step, aspirants need to enter various details like: Name, Father’s Name, Mother’s Name, State of Eligibility etc. After the required information is filled in, candidates will be required to submit the JEE Main 2018 application form. Once the same is submitted, an application number will thus be generated for JEE Main 2018. Students should note down this number as its crucial and will be required for all the further communications. All the scanned images of photograph, signature and thumb impression should be in jpg/jpeg format only. The size of the photograph should be between 4 kb and 40 kb. The size of signature image should be between 1 kb and 30 kb. The size of the thumb impression should be between 1 kb and 30 kb. Image dimension for the photograph: 3.5 cm (width) x 4.5 cm (height) only. Image dimension for the signature: 3.5 cm (length) x 1.5 cm (height) only. Image dimension for the thumb impression: 3.5 cm (length) x 1.5 cm (height) only. The fee may be paid either by credit/debit card or through e-challan generated during the online filling of the application form. In case of e-challan, the payment should be made in the Syndicate/Canara/ICICI Bank in cash. Please note that fee submitted by any other mode like money order, demand draft, IPO etc. will be rejected. Application fee once paid will not be refunded (full or partial) under any circumstances. Credit Card:-1.20% of the examination fee plus the GST as applicable. Debit Card:- 0.75%+GST for examination fee upto Rs.2000 and 1%+GST for examination fee more than Rs.2000. Students can also pay JEE Main 2018 application fee through E-challan. For this, they would be required to download the e-challan generated after the submission of JEE Main 2018 online application form. To pay the fee via e-challan, aspirants need to select a bank (Syndicate/Canara/ICICI/HDFC) to deposit JEE Main 2018 application fee. After this is done, the e-challan with the required details and the amount to be paid will be generated. Candidates will now have to take a print out of the same and go to the nearest branch of the selected bank to pay the fee. Soon after the confirmation of fee payment, they would be able to take a print out of the acknowledge page. JEE Main 2018: The CBSE has released the exam date for JEE Main 2018 Offline exam and application form. The exam will be conducted on April 8th, 2018 and its application form is going to be accessible from 1st December 2017. JEE Main (Joint Entrance Examination) is a top level Engineering Entrance Exam of India conducted by CBSE Board. The candidates can get admissions in B.Tech/B.E/B.Arch courses in NITs, IIITs and other engineering institutions through JEE Mains, though IITs offer admission to these courses through JEE Advanced examination. Candidates who qualify JEE Main Exam will be considered eligible to appear in JEE Advanced examination. Candidates will be provided the direct link to the application on 1st December 2017. Aspirants should stay connected with this post for getting the regular updates on the online application form. Get JEE Main, Exam Updates through e-mail, by entering your details below. 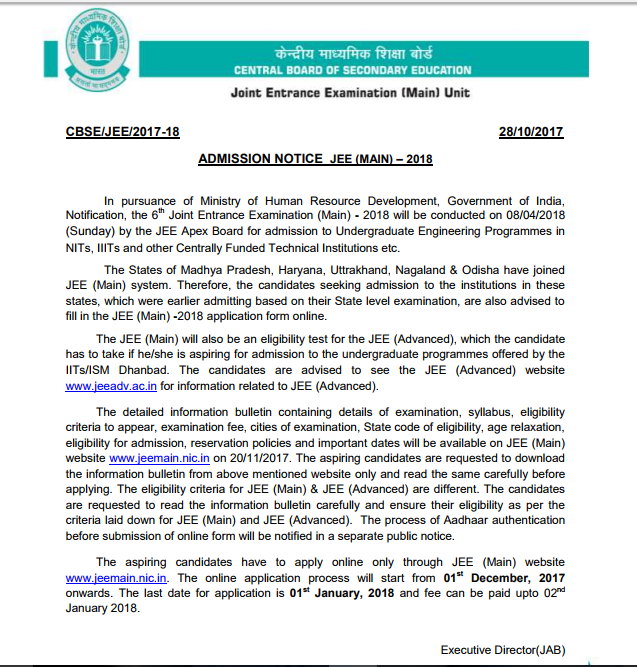 JEE Main 2018 online application form is now live. Direct link to the application has been given below. The JEE Main 2018 Notification has been announced on 22nd November 2017, application form will be accessible from 1st December 2017. Candidates can check all important details related JEE Main 2018 below in this page. All the Indian citizen candidates, who want to apply for JEE Main 2018, should possess Aadhaar card issued by UIDAI. While filling application form of JEE (Main)–2018, the candidates will be required to enter their Aadhaar card number, date of birth, name, & gender, which will be confirmed with the UIDAI’s data. In case, there is a mismatch in the details, the applicants will not be able to fill the application form for JEE (Main) 2018. The candidates, who have already completed or pursuing Class 12th examination from the states of J&K, Meghalaya and Assam, they require to enter the ration card number, passport number, bank account number or any other applicable Govt. identity number provided they should choose the city of entrance test in these states only. The weightage of 12th scores will not be considered for calculating JEE Main All India Rank from 2018. As per MHRD official announcement, for applicants to qualify for admissions to IITs/NITs/IIITs and such other CFTIs, they must have obtained minimum of 75% marks in the 12th class examination, or be in the top 20 percentile in the 12th class exam organized by the respective Boards. For SC/ST category the minimum qualifying marks would be 65% in the 12th class examination. Candidates, who want to appear in JEE Main 2018, should have done class 12th or any equivalent qualifying examination either in 2016 or 2017. Candidates, pursuing in class 12th or any equivalent qualifying exam in the year 2018, may also apply. Candidates should have done 12th or other equivalent qualifying examination with minimum five subjects. Applicants can attempt JEE Main exam 3 times only. Knowing the dates helps candidates to participate in various events of the admission process. I would like to intimate all JEE Main aspirants that the authority has released the official dates for JEE Main 2018. We have updated the table as per the JEE Main notification for the academic year 2018. If you don’t want to miss a single update on JEE Main 2018 then keep your close eyes on this post. Please read below the crucial information about JEE Main online application form. All the details furnished below will help to make successful application for JEE Main. JEE Main 2018 Application Form will be available in online mode only. The application form will be available 1st December 2017 while the last date to fill the JEE Main 2018 application form will be 1st January 2018. No other modes will be entertained by CBSE to fill and submit the JEE Main exam application form except online. Applicants are allowed to submit only one application form. Filling more than one form will lead to rejection. There is no need to send the hard copy of application form to the CBSE Board. JEE Main 2018 Application Form Correction opportunity will be given to applicants only for a specified period of time. Candidates will make changes/corrections in permitted entries only. Eligible candidates can pay the said amount by using debit card/credit card or HDFC/Canara Bank/Syndicate/ICICI e-challan. The authority will release correction facility after completion of the application procedure. But, candidates must keep in their mind that they can make correction in limited particulars of the application form only. Therefore, they should not create a situation when they should wait for the correction date. They must fill the form with utmost care and by ensuring that no mistakes have taken place. The admit card will be available tentatively in second week of March 2018. Candidates will be able to download their admit card by entering the application number and password. Admit card of JEE Main 2018 will comprise important information such as candidate’s name, date of birth, paper, exam schedule, JEE Main 2018 examination center etc. The authority doesn’t allow candidates to appear in the exam if they do not have their genuine admit card. The invigilator will ask you to show one of your photo identity proofs along with admit card. Therefore, please bring one of your identity proofs while coming to the examination centre. Show your admit card to the concerned person if he/she asks you to do the same. Ensure the correctness of data available in your admit card and claim, if there is any sort of errors. Please download your admit card quickly after release of its respective notification. Aspirants can opt for either Paper-1 (B. E. /B. Tech.) or Paper-2 (B. Arch. /B. Planning. ), or for both the papers as per their preferred programs. Paper I consists of total 90 objective type questions from Chemistry, Physics, & Mathematics. Paper 2 consist of total 82 questions from Mathematics, aptitude test and drawing test. Each section contain different amount of questions. The applicants must go through the JEE Main 2018 exam syllabus before starting their preparation. Proper syllabus will help them to plan their study accordingly. Applicants can download or go through the complete syllabus of JEE Main from the official website once it’s released by the concerned authority. CBSE, the concerned authority of JEE Main, will release official answer key for JEE Main for both the papers after the successful completion of the exam. The date of releasing official answer key is 24th to 27th April 2018. The answer key will aid the candidates in cross-checking their answers, what they select in the actual exam. Therefore, they can have a rough idea about the scores they will be receiving in JEE Main 2018 result. JEE Main 2018 result will be announced on 30th April 2018 for Paper 1 and on 31st May 2018 for Paper 2 by the CBSE. Candidates can check their result for JEE Main 2018 online through the official website. After the announcement of result, merit list will be made only on the basis of JEE Main Score. Based on JEE Main 2018 result candidates may appear in JEE Advanced. Under no circumstances, candidates can appear in JEE Advanced until they clear JEE Main. For checking your JEE result you do not need to browse various sites. We’ll update here direct link of accessing your result. JEE Main 2018 score card will be issued after the release of result. The score card will include candidate’s final scores and their JEE MAIN 2018 All India rank. The minimum score needed by the candidates to get admission in the top engineering colleges of the country is known as JEE MAIN cut-off. The JEE Main 2018 Cut-off will be decided by various factors such as difficulty level of test, number of candidates appearing for the exam, marking scheme etc. Please keep in your mind that cutoff varies every year. It depends upon certain factors including difficulty level of the exam, number of students appeared in the exam, number of seats available in participating colleges etc. Therefore i advise aspirants to achieved good marks in the exam for securing a seat in good college. Candidates will be invited for counselling process as per to their rank obtained in the JEE Main 2018 merit list. The JEE Main 2018 Counselling will start from the July, 2018 (Tentatively). The process of Counselling will be managed by JoSAA (Joint Seat Allocation Authority). Ques: Can I change the exam mode? Ques: I applied for both the papers but I only want to appear in paper 1, not paper 2. Can I do so? Ques: If by mistake I have submitted more than one application forms, then would the form be rejected? Ques: My photograph doesn’t have name and date, would the form be rejected? Ques: Is it necessary to upload thumb impression in JEE Main application form? Ques: Can you tell me about HSC vocational courses? Ques: I started making payment of application fee, but the transaction is failed. What to do? There are a plenty of books available in the market you can follow in order to prepare for JEE Main. But, among the plenty of publishers, choosing the best one could be a complex task for you. So, let me minimize your burden. Below, i’m sharing with you the list of few good books for JEE Main 2018 preparation.